This imposing 32-story rental building is one of Manhattan's very few buildings with a major facade curve. It was designed by Costas Kondylis. Its large rounded corner provides many dramatic views to the south and east especially since it is across the avenue from a large mosque designed by Skidmore, Owings & Merrill and set in a large plaza and across the cross-street from a four-story public school. The broad curve softens but not disguise this building's large mass. 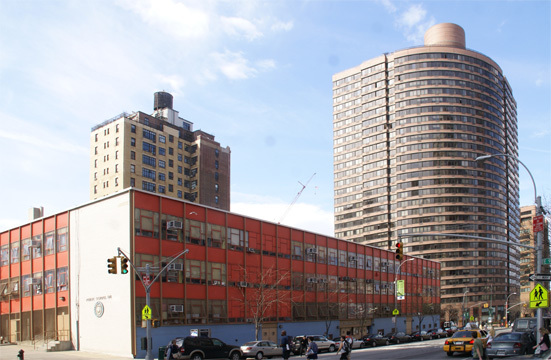 The building is close to several playgrounds and not too far from a major entrance to the FDR Drive. It is very convenient to public transportation and is on the northern fringe of the popular Carnegie Hill neighborhood to the west and south that has many fine private schools and cultural and religious institutions. Erected by the Related Companies in 1992, the building has a health club and pool, a doorman, a concierge, a bicycle room, a children's room, a private garden, a sundeck, a garage, valet service, video security and an impressive lobby. The Related Companies built another major residential tower with a corner curve, Carnegie Park at 200 East 94th Street (see The City Review article), which was designed by Davis Brody & Associates. The building's rooftop watertank is handsomely enclosed in a cylindrical form that is evocative of sleek oceanliner design and the non-curved wings of the building have broad projecting bays that help modulate the design and minimize somewhat its large mass. The building has 19 apartments per floor. This major cross-street has traditionally been the northern boundary of the Upper East Side and the southern boundary of East Harlem and this project was important for the long-term development of this important corridor. The building, which has no balconies, has a pleasant mid-block garden.